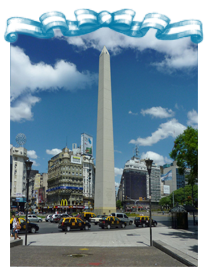 Buenos Aires is the capital of Argentina. It is situated on the shore of the Río de la Plata, and it is one of Latin America’s most important ports and most populous cities, as well as the national centre of commerce, industry, politics, culture, and technology. According to tradition, Spanish colonizer Pedro de Mendoza established the first settlement there, which he named Nuestra Señora Santa María del Buen Aire (“Our Lady St. Mary of the Good Air”). Buenos Aires has an autonomous form of government, with own legislation power and jurisdiction and its mayor is directly elected by its citizens. Its area is of 203 km² (79 sq mi) and its population is around 3,000,000 inhabitants. The Río de La Plata and the Riachuelo are the natural borders of the City on the east and south, respectively. The rest of the metropolitan perimeter is surrounded by Av. General Paz, that bounds the city from north to west. Buenos Aires is connected to the interior of the country and to border countries through a large network of transports which connection points are a port that receives cruisers and ferries, two airports – the international airport: Ministro Pistarini at Ezeiza at 22 km (14 miles) from the Obelisk, and the domestic airport: Jorge Newbery, at 6 km (3.7 miles) from downtown–, railroad tracks, highways, national roads and a passengers terminal station at 1 km from downtown. - Climate: Mild with maritime influence. - Average temperature: 10º C – 50°F (winter) / 24º C – 77°F (summer). The PCO tour operator is Tipgroup. Special offers and local tours can be found in IJCAI Tipgroup site.